2 bedroom apartment, in the sky, new, classified 4 stars tourism, with a surprising architecture, type "patio house on a roof" with its wooden alley on the 6th floor. The entrance to the apartment is then through a small entrance patio. Very quiet, no nuisance of the city, just all local amenities (chocolatier, catering etc). Here everything is done on foot: discovery of Bayonne with its museums, its cinema of art and essays, its magnificent pedestrian streets for shopping. You will also enjoy, for lunch, to laze on the loungers of the large terrace facing south of 27m2 with side view of the river, not overlooked. - Bathroom / Toilets: walk-in shower. The entire apartment is very bright with a large bay window height. All the pieces have their opening. The equipment and decoration are very neat. At the foot of the residence, located right bank of the river, beautiful walks are arranged and offer the most beautiful views of the historic city of Bayonne. This is a lovely, quiet and very well equipped apartment. The location is great and is close to the station with good local food shops. The outside terrace is spacious. Monique and Francois are charming, and very helpful, hosts. C'est un appartement charmant, calme et très bien équipé. L'emplacement est génial et est proche de la gare avec de bons magasins d'alimentation locale. La terrasse extérieure est spacieuse. Monique et François sont des hôtes charmants et très utiles. Bayonne is a beautiful town in the Basque region of France so it has its own personality, not as sophisticated as Paris, not as provincial as Provence, and influenced by the Basque history and the Atlantic Ocean that is close by. This condominium in the St. Espirit district is the perfect place to stay while you explore the region because it is an easy walk to Grand Bayonne and Petit Bayonne and is close to the train station with short rides to San Jean de Luz, Hendaye, or other beautiful coastal towns. We even took an interurban bus to San Sebastian for a couple of days. The bus stop just outside the door can take you to Biarritz and its gorgeous beach in just a few minutes. The home is lovely in its decor and amenities with two love seats and large television in the main room with a table and chairs for dinner or games. In addition, the well-equipped kitchen has a counter top with stools for more casual dining. Then there is the beautiful outdoor space with its view of the Adour River and tables where you might be tempted to enjoy a glass of wine and some cheese. The two bedrooms are comfortable and linens are clean and fresh promising you a good nights rest when you close the automatic black-out shades. The bathroom is roomy and contains a large shower and deluxe Japanese toilet. There is a wine store a block or so from the apartment and also a cheese store close by. We shopped at the nearby bakeries and the supermarket just a block away and found a couple of pizza places and a good Moroccan restaurant in the neighborhood. The pictures of this home do not adequately show the attention to detail and design that the owners have paid. Francios and Monique are delightful people who generously picked us up at the airport and returned us to the airport at the end of our three week visit. They showed us how everything in the home worked and responded quickly when we had a problem with the television. We even attended a small outdoor cocktail party with others who lived on the same floor of the building and enjoyed meeting a high school student who served as our interpreter. I cannot imagine staying in a nicer place. Thank you very much for this very nice comment. We hope you will still make very nice trips! We were very happy to make your stay enjoyable. Perfect equiped appartment, located on walking distance from the citycentre. With view on the river l'Adour we enjoyed our stay in the appartment and the beautiful area. Monique et Francois made sure all the convenience and advice you need, is there. During our recent trip around France by train the apartment was a real jewel. Very tastefully decorated, extremely comfortable with all the equipment you would ever need plus a very warm welcome from hosts Monique and Francois. Thank you for making our stay such a happy one. 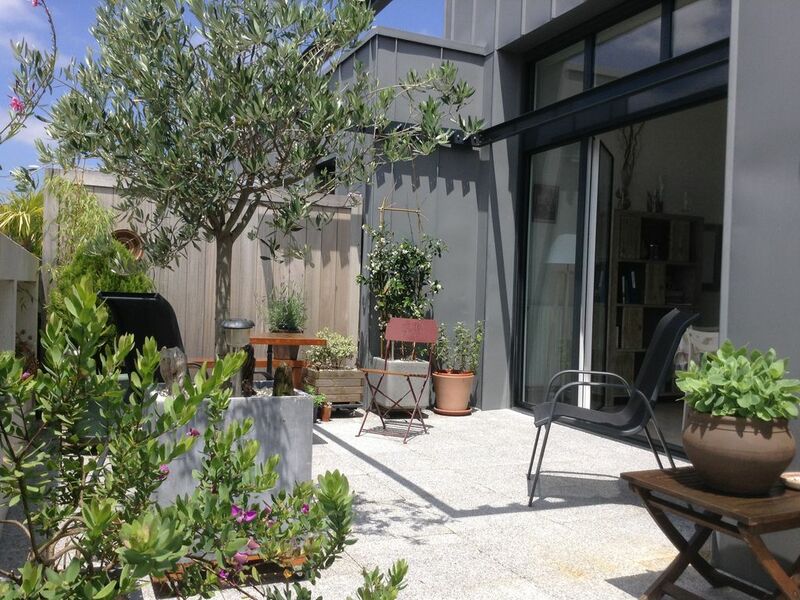 Beautiful, well-equipped and very comfortable apartment with lovely outdoor space in Bayonne. We had a great time in the lovely city of Bayonne. Bayonne combines an historic city experience with fantastic, uncrowded beaches. There are also many other near places to visit very easily such as Biarritz (10 minutes on a £1 Euro bus - bus stop outside the flat), St Jean de Luz, Bidart and San Sebastian (to name but a few). The flat itself is lovely - hi-spec, totally comfortable and very well equipped. We didn't cook much during our stay but if you wanted to, I can't see that there would be any equipment missing. The owners (Monique and Francois) have thought of everything to make their guests feel comfortable. The flat is architect-designed, very light and airy with a lovely kitchen and a large outdoor patio space. The beds are comfortable, all the furniture is well-chosen and everything is spotlessly clean. The overall design, both interior and exterior is excellent. Monique and Francois met us on our arrival and explained the flat's entry codes and gave us other very useful information about the area. They are lovely, friendly and welcoming people who really care about their guests' experiences. We would happily go back any time. 1) You can hire bikes free from the Tourist Information Office. 2) The £1 Euro bus to Biarritz stops outside the flat. 3) There is a supermarket more or less beneath the flat a few blocks down. 4) Great boulangerie opposite the apartment block. 6) We thought the area of St Esprit itself was lovely - really enjoyed being there. 7) Underground parking so you never need to look for anywhere to park. We cannot think of any negative points about this booking - all wonderful. I thank especially Barbara and her husband for the very nice comment after their "discovery of the Basque country" stay in our apartment in Bayonne. We always try to be attentive to the comfort of our guests, of small detail that will surprise them. This comment rewards us and we "boosted" also to continue to delight our guests. We are always happy to "contribute a little bit" to the success of their holiday. Barbara, with its spontaneity, curiosity..., was a great meeting! Lovely, spacious, tastefully decorated apartment with great view from terrace. also good access to highway, if you want to explore the surrounding area. Host was very helpful in settling us in. Would go back there in a heart beat. The Basque country is a high tourist area in color with its red and white houses. From Bayonne, south, 33 kms from side to discover Spain, via Biarritz, St. Jean de Luz, Biarritz, Ciboure and the splendid bay of Hendaye. Leaving Bayonne, going up, discover immediately, the Landes with its beaches and pine forests. The back country is not far behind with Epelette (20kms) and peppers drying on the walls of houses and pursuing his path St Jean foot of Port. Bayonne is the essential starting point for visiting the Basque country. It offers multiple animations summer. It is a very festive city.